It climbs up brownstones and turns fences into bushy green hedges. It also smothers tree trunks and sometimes can carpet large stretches of ground. 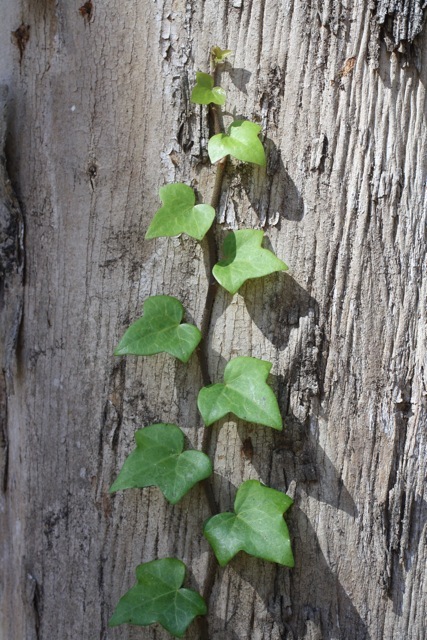 Wherever you find it, English ivy (Hedera helix) is a vigorous plant. It’s considered a serious invasive; in some places the carpet of ivy is so vast–and uninhabited by other species– that it’s called an “ivy desert”. Ivy is best known for the strongly lobed, three-pointed leaves it sprouts when young. At first, I didn’t recognize the unlobed, “adult” leaves as the same plant–but they are. Older branches get thick and woody, and can have furrowed bark. Right now these mature vines are sprouting pom-pom-like flower buds; eventually these will give way to clusters of dark purple berries. When English ivy grows on the ground, it only reaches a height of 8 inches or so as the single leaves reach toward the sky. But once it reaches something to climb, it can easily ascend 90 feet into the air, clinging to root-like structures that produce an adhesive glue-like goo. Some particularly robust plants can climb up to 300 feet! Individual plants have been found to be over 60 years old. I once worked for a restoration company where one of our jobs was to clear ivy. One of the best ways to get rid of it where it had covered the ground was to chop into a leading edge with a hoe or shovel, and then roll the whole mass up like a rug. It was hard work but oddly satisfying at the same time.